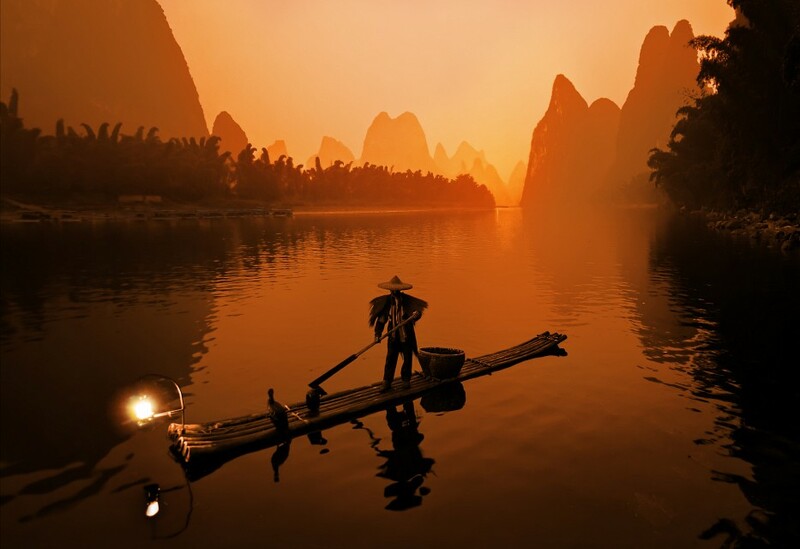 Guilin is located on the Li River, in the province of Guangxi, in Southwest China. The name of the city translates to ‘Forest of Sweet Osmanthus’, because of the large number of Sweet Osmanthus trees located throughout the city. Guilin experiences a sub-tropical climate, with very short, mild winters and long, hot summers. It is wet almost all year-round, and the climate is influenced heavily by the monsoon season. With a population of just 4.7 million people, located over an area of 16,777 miles, it is considered a small city by Chinese standards. The beginnings of Guilin can be traced all the way back to 314 BC, when a small settlement was established along the banks of the Li River. The settlement remained fairly unchanged for hundreds of years until 111 BC, during the Han Dynasty , when Shi An County was established. The city was renamed ‘Guizhou’ in 507 AD, and remained a county for many years, providing a bridge between the central government and the Chinese border, and it was used a base for armies that guarded the border. Canals were also built throughout the city to allow the easy transportation of food to the southwest of the Chinese border. It wasn't until 1940 that the city acquired its current name. Guilin has always be regarded as one the most beautiful places in China, and this was confirmed officially, when in 1981, the government listed Guilin as one of four cities that should be treated as a ‘priority project’ because of the historical and cultural heritage. 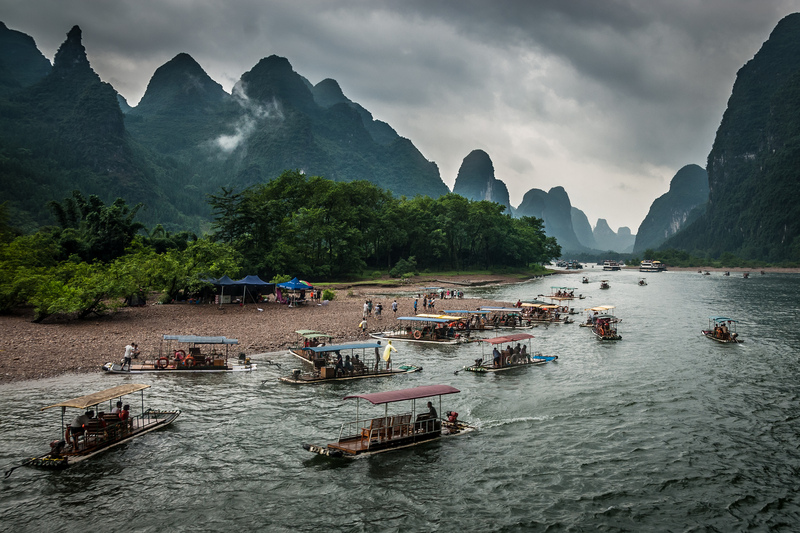 The Li River is Guilin’s number one highlight, and there are a number of ways to experience it. Running for 52 miles, it carves through the Karst topography, making the infamous Li River cruise a truly spectacular journey. 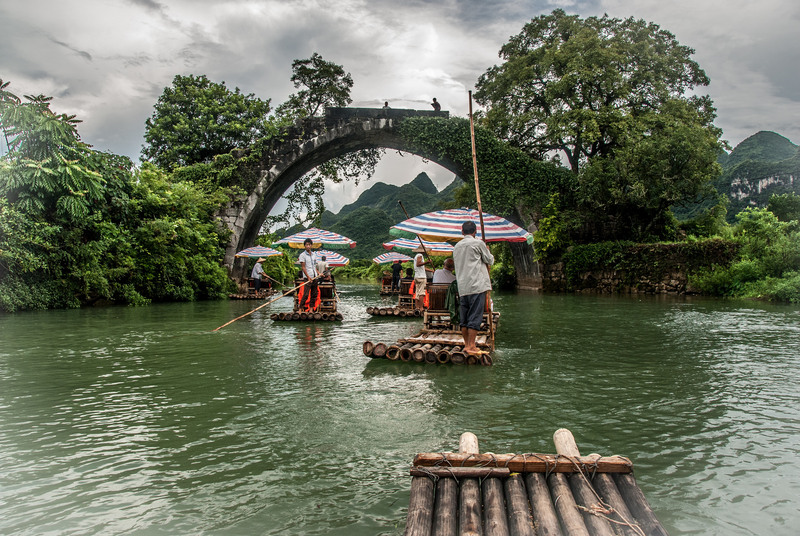 You will usually travel from Guilin to Yangshuo County, and then back, or alternatively, one can take a taxi or bus back. Many visitors also decide to make the trip to Yangshuo, and then spend a few days exploring the town. 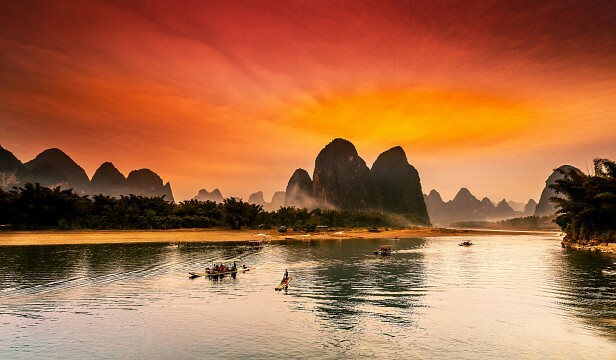 There is no shortage of Li River Cruise operators in Guilin, and they do not vary greatly from one another, so your best bet is to go for one of the cheaper options. Along the cruise you will see rolling hills, impressive mountain ranges, and you may even be able to spot a water buffalo. Brace yourself for lots of tourists as well; it is unlikely you will be on your own raft, and you will never be out of sight of other local and international tourists. Some companies will take you in bigger tour boats, while with others you have the option of taking a traditional raft. The rafts mean you will only be restricted to four people on each boat, and this is a more intimate experience. Although you cannot swim in the river, on the rafts you can at least dip your feet in. There are various points from within Guilin that the tour may start, but in general it is expected to take 4 to 5 hours to travel the whole 52 miles. The landscape along the cruise is breathtaking in itself but there are a number of special sights to look out for. 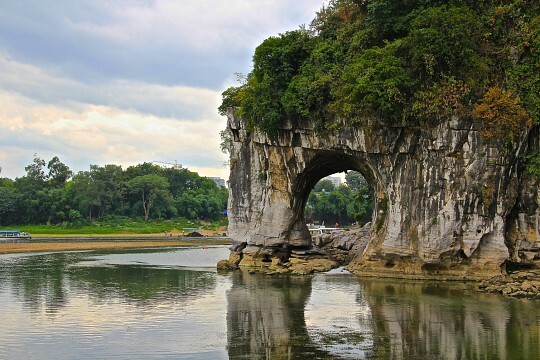 Travelling from Guilin, on the western bank of the river is Elephant Trunk Hill, a hill – that can be climbed – that is said to look like an elephant drinking from the river. You have to know what you’re looking at to see it, but the climb to the top of the hill is worth doing, and is accessible from Guilin. Travelling down from Elephant Trunk Hill, you reach Pagoda Hill, also on the Western Bank. It is a small pagoda, dating from the Ming Dynasty , and is also accessible by foot, though views from the river are just as good. For a feel of an ancient town, stop off at Daxu Town, a town that has kept its style from the Ming Dynasty. This is also a good place to stop for lunch; the dumplings at the peddle cars and stalls are cheap and tasty. Aside from sights located along the river, Guilin has few other attractions. Seven Stars Park, located on the east bank of the river, is a huge 120 hectares of mountains, valleys, and a fascinating stone forest. Admission fee is 75 CNY, and is accessible with a number of bus routes. You could visit the whole park in as little as an hour, or take as long as a whole day to really appreciate all the sights. 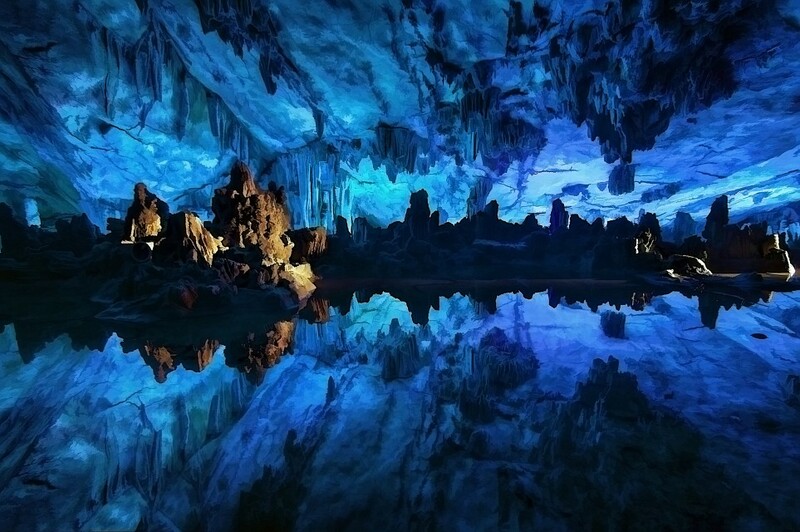 The Reed Flute Cave is a beautiful limestone cave. The high number of tourists, both international and local who travel to Guilin means there is a wide variety of international dishes alongside the expected noodles, and dumplings. If you have been travelling across China for a while, and are looking for some quality Western food, Guilin is a good place for a hamburger. The American BBQ Sportsbar and Grill is owned by a friendly American, and serves up ‘real American’ hamburgers and fries, as well as a variety of sandwiches. Find it just down the street from the Sheraton Hotel as the road bends away from the river. If for some reason you are craving Indian, Guilin does offer Indian dishes as well. Kali Mirch, located on Bin Jiang Pedestrian Street, is one of the best restaurants in Guilin. It is a little hard to find, located behind the Sheraton Hotel, on a street filled with other food vendors, but if you really can’t find it, make a call to the restaurant and they will pick you up. Guilin is particularly known for its snacks, and the use of spices such as chili. Guilin has a special chili sauce, made and used by locals consisting of fresh chili, garlic, and fermented soybeans. Zhengyang Pedestrian Street is located at the backside of center square, and was built to be exactly 2,185 feet, as this number is thought to bring good fortune. There are lots of fashion brand shops, as well as restaurants and night clubs, and most of the buildings are decorated in traditional Chinese ancient styles. The biggest shopping mall in Guilin, Niko Niko Do, is located on Zhongshan Road, and has nine floors of clothing, bags, electronics, and just about anything else you could want. 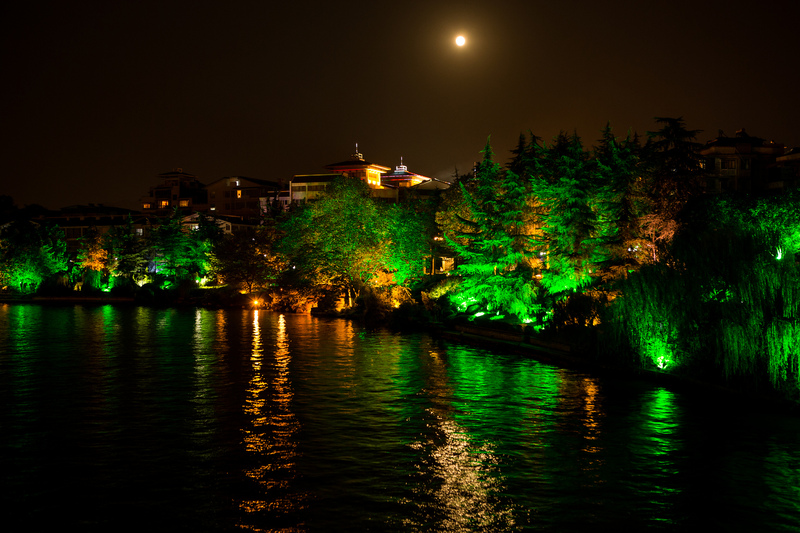 One of the nicest places to find souvenirs is the Night Market, open every evening from 19.00 PM to midnight. The market is filled with vendors selling small souvenirs and snacks – make sure you bargain for everything, and you can get some nice souvenirs at good prices. The barbecue stalls are also tasty, and the meat is fresh and well-cooked. For something a little different, and for the altruist in you, head to the Wayao International Tourism Commodity Wholesale Market, located on West Wayao road, up to 1,000 shops sell wholesale food and crafts. 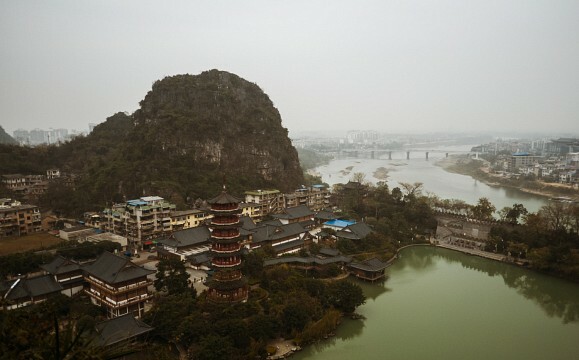 The first craft trade fairs of Guilin were located here, and there continues to be a bustling trade. There is no shortage of hostels in Guilin, with a large international crowd passing through, as well as many international teachers who call Guilin home. The Ming Palace International Hostel located on Dong Hua Road, is one of the best budget places to sleep, offering private rooms from $ 8.00 USD a night. The hostel can also offer discounted tickets for nearby attractions, free laundry, and - a unique selling point in China – Facebook and Twitter access. Like many other hostels in China, the Ming Palace hosts a free Sunday Night dumpling party. For a more expensive option, check out airbnb.com, where you can find entire apartments, as well as rooms to rent in Guilin. One of the best, is a post by Daisy, where for $ 70 USD a night, you have access to a three bedroom home, accommodating up to 8 people. You also have your own kitchen, and internet access. Daisy is also a certified tour guide as well as a Chinese teacher, so can easily equip you some useful phrases as well as give formal lessons. The Sheraton in the Guilin, is easily of one the nicest hotels, and is extremely centrally located, just off the Pedestrian Street, with views of the Li River. At $ 74 USD a night, it is cheaper in comparison to other Sheraton hotels, and offers good value for money. Although the located is its biggest selling point, the breakfast is also excellent. 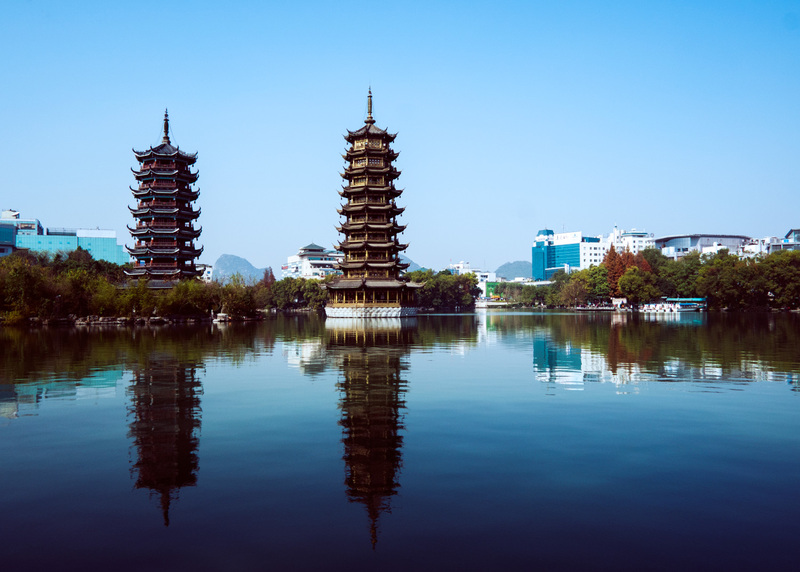 Despite its size, Guilin operates an international airport, as well as a number of budget airlines to local destinations. The airport is located 19 miles from the city, and there is a cheap shuttle bus service. Although there are international flights, most of these are from nearby countries, and cities such as Hong Kong. Using the train is one of the most popular ways to get to Guilin. There are two train stations, and both are located near the city. There are lots of sleeper train services from Guilin to all over China, though it can be difficult to buy the tickets, and the trains fill up quickly. There is a train from Guilin to Beijing, with the fastest one taking 22 hours. The train to Hong Kong travels through Shenzhen, and this journey takes about an hour. 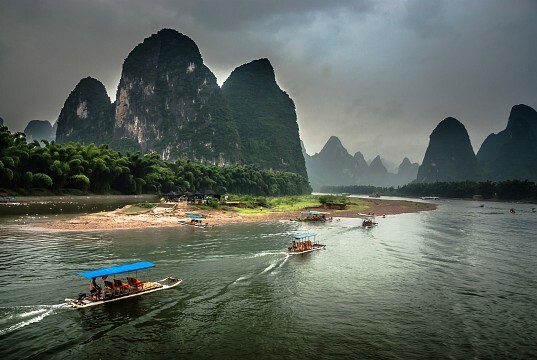 You can of course arrive by boat, though this is only really feasible if coming from Yangshuo.